While others wouldn’t think twice about it and love the versatility and speed in assembly they offer, not to mention they also tackle a lot of home renovation jobs where they’re invaluable. 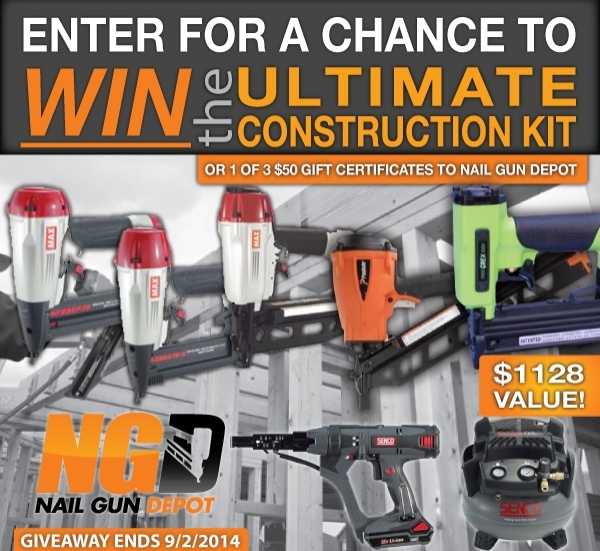 Throughout the campaign, contestants can enter to win the grand prize “Ultimate Construction Kit,” or one of three $50 gift certificates to NailGunDepot.com. § One Senco PC1280 compressor. One gift certificate winner will be drawn on the 15th of each month, leading up to the grand prize drawing on September 2. Good luck, and let me know if you’re a winner of one of the monthly prizes or better yet the grand prize! Now This Is Some Giveaways!! !